The resolution test of the Samyang 1.4/35 was based on RAW files from the full frame Nikon D3x reflex camera. The measurement errors ranged from 0.3 to 0.9 lpmm. 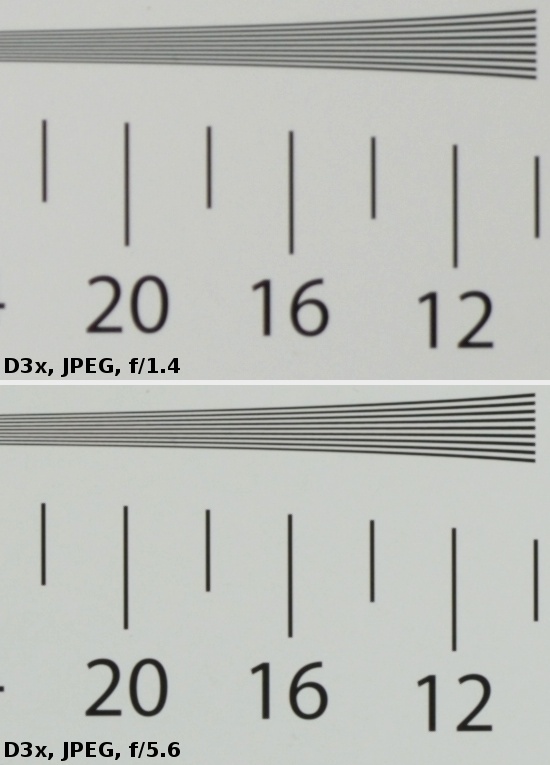 It’s worth reminding here that in the case of D3x-based tests the decency level amounts to 30-31 lpmm and the best fixed-focal lenses can reach results as high as 46-47 lpmm. We should add that that decency level presented here has been pre-arranged by us and is purely conventional. 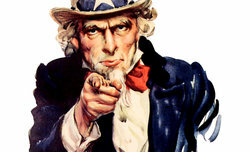 In order to determine such a value we assumed that the level reached by a lens by f/16 would be a good quality indicator. When we stop down the aperture further the diffraction will degenerate images so much that they appear slightly fuzzy. Of course you should remember that every user has his/her own demands concerning a lens - for some this 30-31 lpmm level will be totally acceptable and for others it won’t meet their image usefulness requirements. Let’s see how the Samyang performs in the frame centre (red squares), on the edge of the APS-C/DX sensor (blue squares) and on the edge of full frame (green squares) as well. 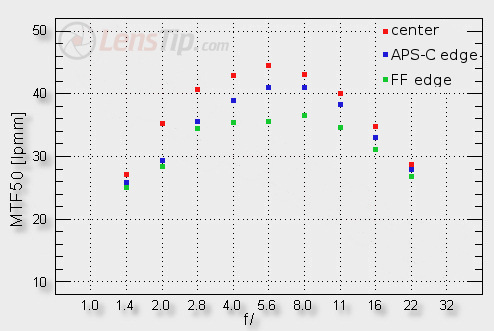 You can notice immediately that by f/1.4 we can’t speak about full usefulness because the lens gets near 27 lpmm there. On slight stopping down the image becomes acceptable and by f/2.0 it is already of good quality – we reach the values of 35 lpmm there. What’s interesting these results are better than in the case of the Nikkor 1.4/35G, tested by us not so long ago or the Sony 1.4/35G. The Samyang was only worse than the Canon 35L, which could provide fully useful images already up from the maximum relative aperture. When we stop down even further the Samyang starts to give us images of very good, even splendid quality. It doesn’t break any records, though, and in the f/2.8-f/8.0 aperture range it is a bit worse than its prestigious competitors, which results are truly record-breaking. The performance of the tested lens on the frame's edge is interesting. Overall we get good or even very good results there – they don’t lag behind those we observed in the frame centre; on stopping down the aperture to ca. f/2.2 you can enjoy sharp images even on the full frame edge. The Nikkor and the Sony can only dream about similar results; even the Canon 35L didn’t fare better. A round of applause for the Samyang then! At the end of this chapter we present some crops taken from the frame centre of our test chart photos; we used JPEG files saved along RAW files on which the analysis above was based. Strona wygenerowana w 0.059 sek.